So, you’ve finally realized that filling your monitor with a collage of post-it notes is perhaps not the best way to keep track of your thoughts. Great! But now what? Thankfully the web is full of note taking and note organizing apps. And today, we’ll take a look at what might be the most popular one: Evernote. And you can choose from many different ways to share your notes, allowing you to better manage tasks, communicate with your team, and even market your content. Opening an account is free but some features require a subscription. There are three tiers to choose from: Basic, Premium, and Business. These subscription plans are available via monthly and annual fees, the latter of which nets you a discount. You can start with a free trial, too. The Premium plan costs under $10/month. The Business tier is aimed at workgroups. This provides access to a feature called “Spaces” giving the members of your team the ability to keep in sync, work closer, and stay on the same page as all notes and relevant information is accessible to everyone on the team. If you want to use Evernote to complement your WordPress business, the two need to be integrated. 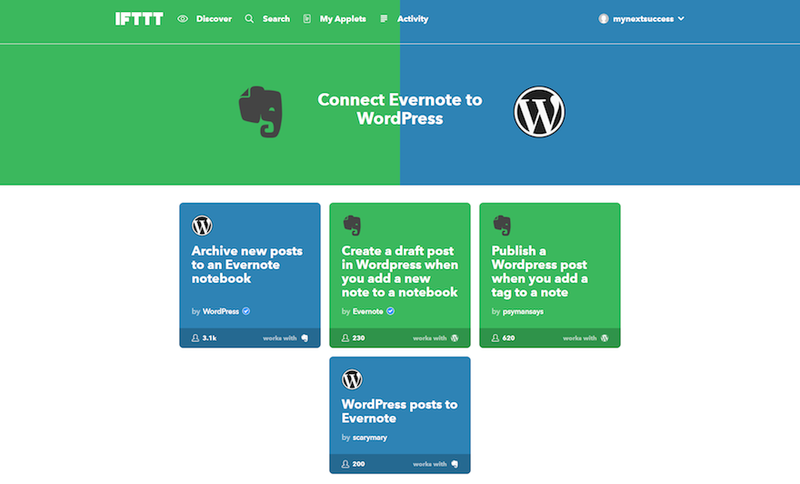 Evernote integrates with WordPress in several ways, the most notable being its IFTTT support. Let’s explore your options. This is, of course, asking for your WordPress login credentials and the URL of the particular site into which you want the Evernote features to be integrated. They are now both connected. Shareaholic focuses on streamlining the social sharing process for your site, it also tracks several statistics, so you can better understand who your site visitors are. For instance, it keeps a graph of your first-time visitors, those who clicked on advertisements, and your affiliate programs. It’s an all-around useful plugin for monitoring the trends that benefit your site goals. Plus, it includes an Evernote integration that allows you to share content from a live WordPress site to an Evernote notebook. Quickly identify what internal links to add to new posts. The applet for this is available through IFTTT. If you’re brainstorming in Evernote, wouldn’t it be great if your fantastic new post ideas were automatically added to your WordPress site? Well, you can do precisely that thanks to another IFTTT applet and have a new post draft created whenever you create a note in a specified notebook (or several) that you determine. This allows for on-the-fly accessibility and content creation. Each new draft is formatted with the correct headers, categories, tags, etc. This saves you a significant amount of time in copying and pasting content over to WordPress manually. Evernote’s text editor features all the same tools you use in WordPress, as well. Best of all, you can attach files and images to your drafts via Evernote, too. This is one of my favorite applets. It works similarly to creating WordPress drafts from notes, as mentioned above. However, this time you can publish your content using tags. You simply create a notebook that is connected to your WordPress site. Then, you create a tag in Evernote, i.e. “new posts.” Then, whenever this tag is added to a note (in a notebook connected to WordPress) it will automatically publish to your blog. Building on this function, you can build an editorial calendar by creating a notebook for each month and a different note for each post. With this, you can automate when content is published since you have the option to set a “timer” on any given note. Set notes to notify you via email, phone, or through the Evernote app, when a note is pushed live, too. “Spaces” are one of the best features of Evernote Business. Simply put, it allows you to create workspaces for collaboration within workgroups. You also get to choose who has access. With it, you can share new site ideas, marketing projects, and content marketing plans with a team, clients, development and research groups, and anyone else who might be able to contribute to your workflow. Bulletins: These can be used to keep focus and manage the tasks at hand. Delegate maintenance: If you share development or maintenance of a WordPress website, you can use the IFTTT integration to let others allowed in your workgroup (and with admin privileges to your site) to take over for tasks. This allows your focus to rest on other aspects of business development. Client communication: The Business features also allow for improved communication with clients, so contact is organized and transparent. From scheduling meetings to keeping on track of feedback or alterations a client may need, you can manage it all here. Evernote is, at its heart, a premier note-taking service. It offers expanded accessibility and can act as an essential component of your business. Knowing how to incorporate it into your WordPress workflow is key. Hopefully, you now have a solid understanding of this. And with its versatile structure, Evernote (like WordPress) is best approached with an eye for extensibility. Over to you: Has Evernote helped you better manage WordPress projects and goals? If so, how? Feel free to sound off in the comments below. I’ve been using Evernote for a few years now but only copying and pasting between it and WordPress. I’ll certainly try your tips and get back to you. I have been running a no-profit website that has built a world peace bell in Canberra Australia and now need to allow some helpers be part of the maintenance of the site and your Evernote ideas could be be perfect as they are not great tech users! Wow! I never thought of using Evernote in these ways. You just made my days a whole lot easier.